The Garden Detective: More or Vole? And What Can You Do? Blog / Pest Management / The Garden Detective: Mole or Vole? And What Can You Do? The Garden Detective: Mole or Vole? And What Can You Do? “How do I control moles and voles in my lawn and garden?” Now is the time of year our Extension Master GardenerSM Helpline is flooded with this question! If your lawn and garden is riddled with holes, lines of raised earth, or volcano shaped-hills, then you have either moles or voles! These critters have been with us a long time, though, so you need to consider your threshold of frustration and commitment in planning your strategy to deal with them. Mole or vole? Take the quiz. If you can correctly answer all five Mole/Vole questions below, you don’t need to read this article—unless you want to find out how to get rid of them! Eats primarily insects, earthworms and grubs. Mole/Vole? Eats primarily plants (bulbs, tubers, roots, and bark of trees). Mole/Vole? Is a protected species in North Carolina. Mole/Vole? Has big front feet and hairless snout. Mole/Vole? Looks like a mouse. Mole/Vole? Before you can formulate a “good riddance” strategy, you have to know “what” you are trying to get rid of! 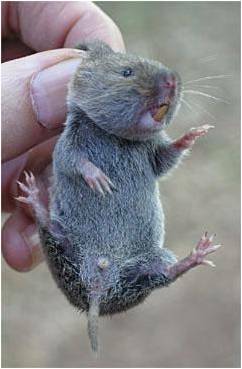 Appearance: The most obvious difference between a mole and vole is shoe size! Moles have BIG paddle-like feet (think clowns). Voles have dainty mouse-like feet (think Cinderella). Habitat: Moles build volcano-like hills (molehills!) at tunnel entrances. Voles make 1- to 2-inch holes level with the ground. Feeding behavior: Moles eat insects, grubs, and earthworms. Voles eat plant parts—roots, bulbs, and tree bark. 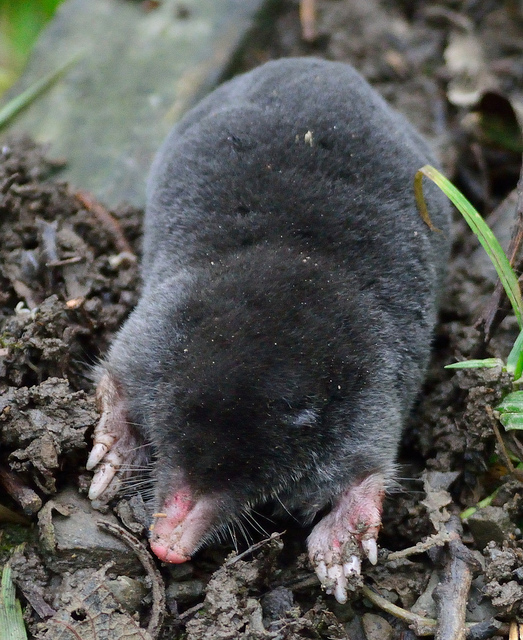 Three species of moles live in Western North Carolina: eastern moles (Scalopus aquaticus), hairy-tailed moles (Parascalops breweri), and star-nosed moles (Condylura cristata parva). In addition to big paddle-like front feet designed for digging, all these moles have very small eyes, hairless snouts, and ear openings hidden by fur. They are 4 to 6 inches long and tend to live alone underground, so you will typically find only 3 to 5 moles per acre, even in a heavily populated area. Star-nosed moles are a protected species that live in wet, marshy areas and can eat underwater. Eastern and hairy-tailed moles are more likely the moles that you’ll find making tunnels with visible ridges, especially in lawns. Moles can eat up to 100% of their body weight a day, so may be considered garden helpers if you don’t mind their tunnels! If you want to eliminate moles, however, the fact that star-nosed moles are a protected species means that North Carolina has not approved pesticides to kill moles. 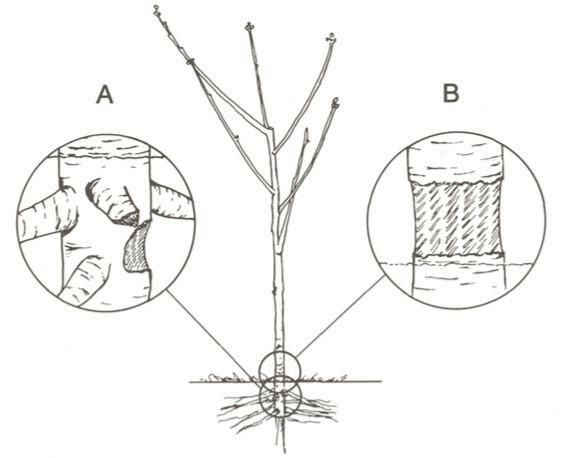 The North Carolina Agricultural Chemicals Manual recommends using a spear-type trap for non-protected moles—or a ground insecticide to kill soil grubs. Killing grubs still leaves other insects and earthworms for the moles to eat, so it may not be effective. If you go the insecticide route, be sure to follow the directions carefully and take all recommended safety precautions. Repellents may help but need frequent reapplication. Folk remedies, such as mixing gum or glass shards in the soil, are not effective! Walking on the tunnels may bring you some satisfaction and frustrate the moles. Hiring a professional with the required licenses may be the best bet; see Wildlife Damage Control Agents in Buncombe County. North Carolina has two species of voles—the meadow vole (Microtus pennsylvanicus) and pine vole (Microtus pinetorum). They look like mice with stocky bodies, short legs and tails. They have small black eyes and furry ears set close to the head. The big difference in appearance between mice and voles is that mice have long tails and voles have very short tails with hair. Unlike moles, voles like to live with other voles. A burrow system can have several adults and babies. Even though voles only live 2 to 16 months, they breed throughout the year with a gestation period of only 21 days. They can have up to 6 litters of 2 to 4 babies per litter! Plant damage: (A) Below ground damage is pine vole. (B) Above ground damage is meadow vole. Mousetraps are the most effective management technique for small vole populations. Place the mousetrap baited with apple or peanut butter near vole holes. Cover the trap and the hole with a bucket. Traps must be in the dark for the vole to come out and eat. This method is most effective in the winter (November to March) when their food supply is low. Mixing commercial products with hard or sharp edges can deter voles. 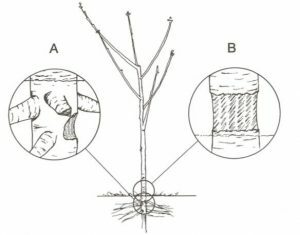 Installing underground barriers, such as hardware cloth (less than a ¼ inch mesh), can help, but may interfere with root growth. Rodenticides can kill the voles, but also harm vole predators. Hawks, owls, snakes, weasels, raccoons, foxes, opossums, dogs, and cats can die as a result of eating a poisoned vole! Poisons also put children at risk. Article written by Kay Green, Extension Master GardenerSM Volunteer.